This was a really fun disc that immediately made me think of the Teletubbies. When you realise that they are made by the same mob then it starts to make sense. What are the Boohbahs? Well let me enlighten you. They are five magical atoms symbolising power light and fun and the kids will get into them as they are very bright and pleasing to look at. Combining some pretty neat CGI and other techniques, your children will be spellbound as the Boohbahs challenge their thinking with a series encapsulating imagination and movement. Each segment on the disc has activities and a story. It's simply a lot of fun that is pretty well laid out. The other great thing about this one is that it runs for 80 minutes which is a fair bit longer than your standard children's fair. My first response was to say that it ran too long, however with the four episodes, you don't have to play them all at once. 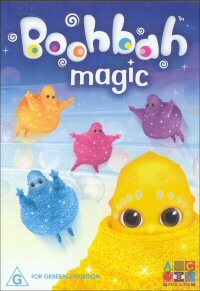 For those of you who want to see more of the Boohbah folk before commiting to the DVD, I suggest you check out the site http://www.boohbah.tv/ It's pretty easy to navigate, and there are some fun activities on there.